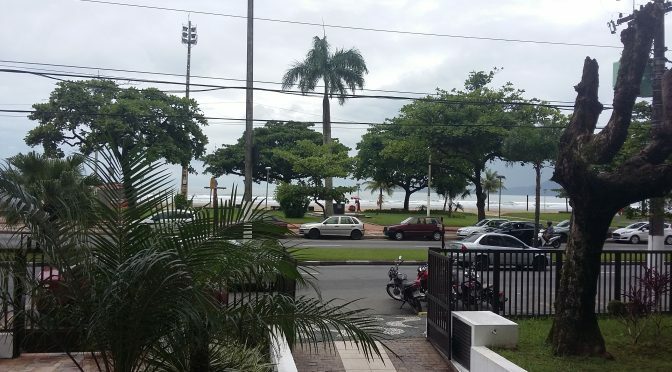 So far we have spent just over 2 weeks in Santos with Dona Ermida, staying in her apartment on the Avenida de Bartolomeu Gusmao right across the road from the beach. Our first week was rather wet and over cast but suddenly, as the Christmas holidays approached, the rain receded and the temperatures rose and we now have afternoon temperatures in the low 40s and even over night it is in the high 20s! 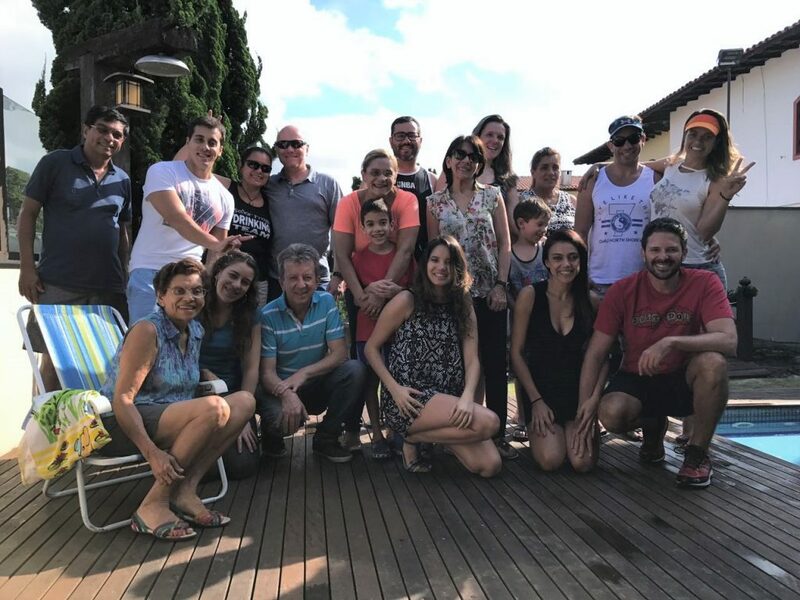 We spent Christmas in Sao Paulo with Valeria’s quite large family and we are spending New Year in Santos on the beach watching the fire works. Unfortunately as New Year’s Eve progresses the rain has returned …. apparently a regular feature of the festivities, even here! 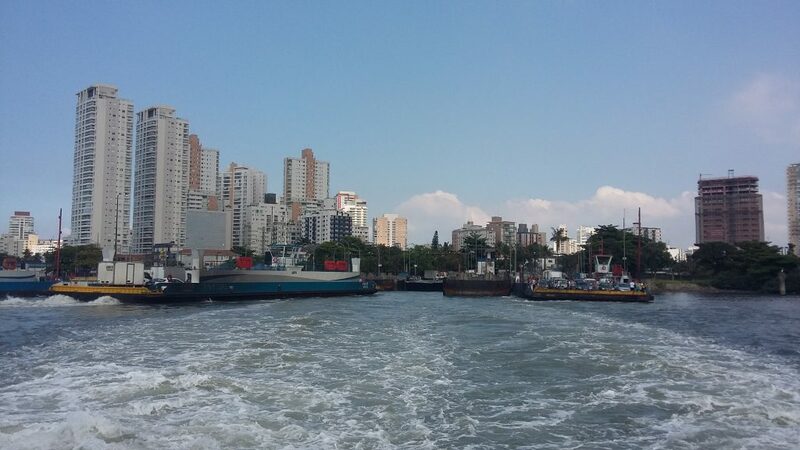 Santos is the port for Sao Paulo and as you would expect is busy; the entry channel runs along the eastern end of the sea front into the and is always busy with shipping. The port was originally the main route for coffee exports but has the dubious claim to fame as the ‘port of entry’ for bubonic plague in 1899! The city of Santos is on the eastern end of the large island of Sao Vincente which completely fills what would be a bay if the island wasn’t there; on the western end of the island is the city of Sao Vincente. The port is on the sheltered north and eastern side of the island and that part of town, as you’d expect for a port, is not the most welcoming part of town; but as you move towards the beaches the buildings get taller and their density increases until you reach the sea front where almost all the buildings are apartment blocks, interspersed with the odd church and a few original buildings. 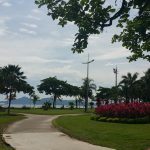 The sea front is the most attractive part of town and just behind the beach is the beach front garden which is in the Guinness Book of Records as the largest such garden in the world. 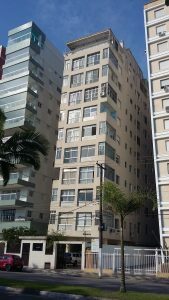 Another interesting ‘architectural feature’ of Santos becomes apparent as you stroll along the beach front and it illustrates one of the perils of building on a beach …… there are a host of leaning apartment blocks. Mercifully, despite the leaning they appear to have been stabilised. One street back from the seafront the streets are a full of shops and are generally very busy. 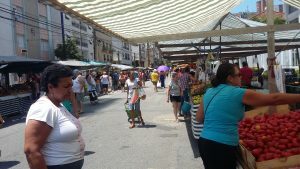 Every Tuesday there is a huge fresh fruit and veg market a few streets from Ermida’s apartment and in contrast with many other prices in Brazil the market prices are refreshingly inexpensive! Most staples are on sale for R$1 (about 25 p) for a kilo of any mix of produce. 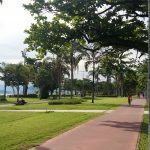 Moving around Santos is easy as most places we need are within walking distance or a short cab ride away but the major factor in longer distance travel plans is the sheer volume of traffic, especially at this time of year. A large proportion of Sao Paulo residents want to spend their holidays on the beach. The ‘challenge’ is getting there as there are only two main motorway routes from Santos to Sao Paulo, Imigrantes and Anchieta (named for one of the original Jesuit priest who founded the mission at Sao Paulo in 1554). During busy holiday periods they operate a form of contraflow using these two roads; even then congestion is ‘impressive’ and journey times ‘extended’. 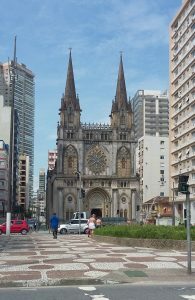 We have made the journey between Sao Paulo and Santos by coach a couple of times, in addition to being chauffeured there for Christmas, and I have come across another interesting feature of travel in Brazil – you need photo ID to get on the coach. Not sure why yet as the driver simply checks you have an ID document of some sort (UK Driver’s Licence in our cases) and checks something is written in the passenger information section of the ticket stub – he doesn’t check the ID against the bearer or against what is written on the ticket; sometimes they don’t check at all and sometimes, when the Gringo forgets his ID, they’ll let you on anyway. I am sure there is a reason for this but it so far escapes me! 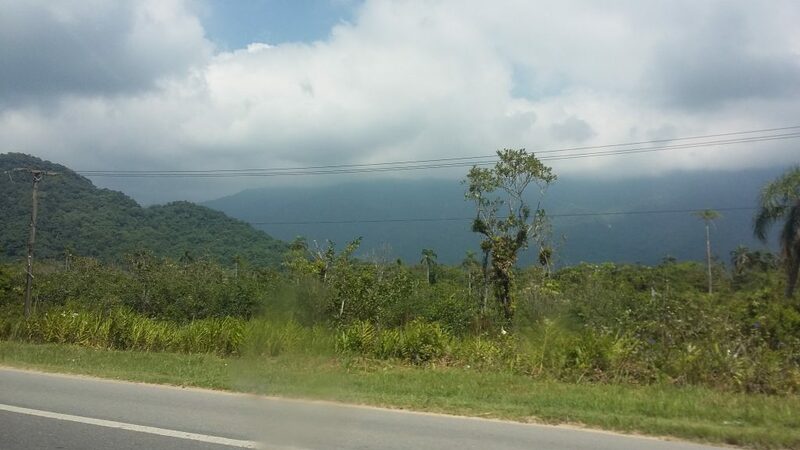 Another striking feature of travelling around here is the forest. 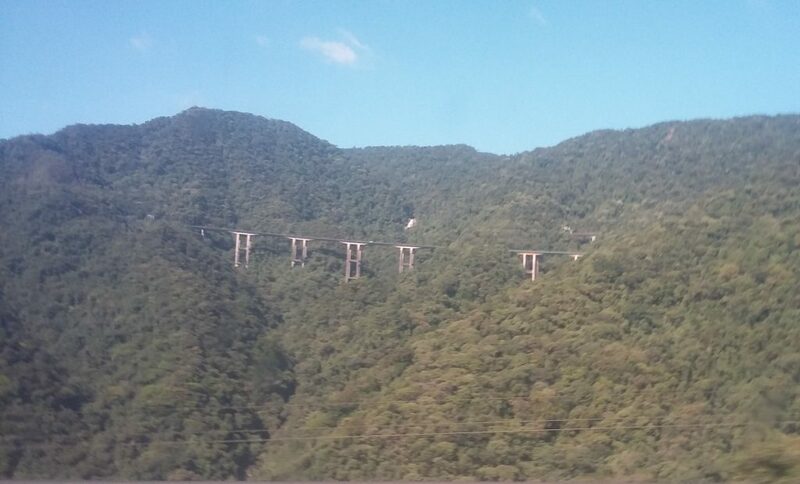 As soon as you leave the built up areas you are straight into the Atlantic Forest which carpets the coast and the Serra do Mar mountains immediately inland; these rise up to the Brazilian Highlands plateau some 800m above sea level where you very soon encounter the outskirts of Sao Paulo. 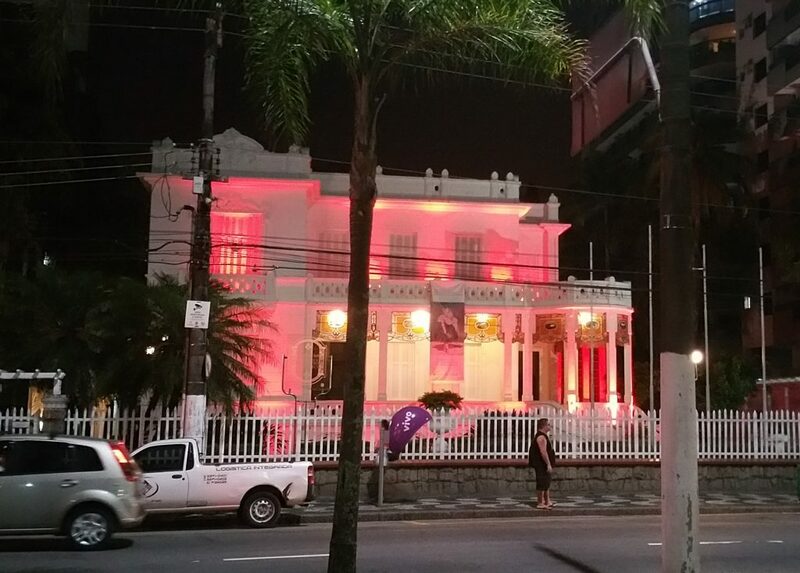 In the New Year we will be travelling south to Florianopolis, making our way back to Santos via Santa Caterina and Parana States; Valeria has been hard at work arranging car hire and hotels. But that is next year, for now we are watching the old year being washed away, hoping the rain will run out before 2016 does!